Every Wednesday unless weather conditions are severe (regular amounts of snow won't stop us from going out! 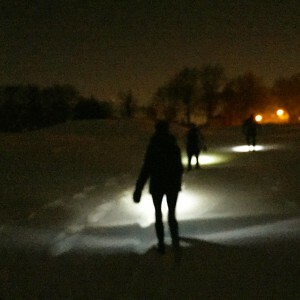 ): Join us for our weekly evening, guided hike where we will cover 4/5 miles. There are some small climbs but it's fairly easy. We try to maintain a quick pace but can accommodate all skill levels. 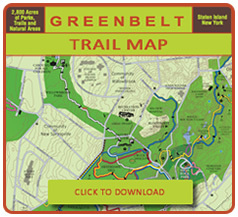 You will see parts of the Greenbelt and the trail system that you haven't seen before! 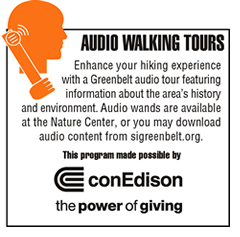 We typically meet at the Greenbelt Nature Center unless there is a special program being held, in which case we begin and end at the LaTourette Golf Course Clubhouse, 1001 Richmond Hill Road. Always check the event listings here for any changes. Dress for the weather and trail conditions. Proper footwear is essential. Bring water and a snack if you think you'll need it. No reservation is required. We go in all weather unless conditions are dangerous (thunder storms). Always check the Greenbelt Conservancy's Facebook page for updates on changes or cancellations (Cancellations generally only occur in very bad weather). As the days get shorter, we will leave and return in the dark so please bring a flashlight or headlamp to be prepared. 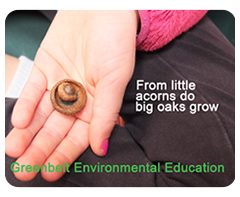 The Greenbelt Conservancy is a not-for-profit organization working in partnership with NYC Parks to care for the Greenbelt's 2,800 acres of open space, parks, trail system and public facilities in central Staten Island.